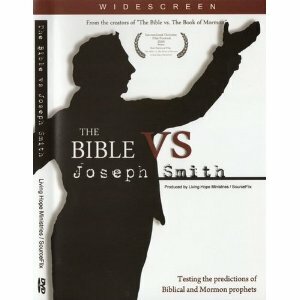 “Bible vs Joseph Smith” DVD outreach opportunity. This will be very short. Several people have contacted us about the possibility of purchasing THE BIBLE vs JOSEPH SMITH DVD at the discounted price of $1.75 ea. If you are still thinking about ordering, the time to act is NOW because we are ready to place our order.So far 46 people from all over the country (plus one from Africa) have ordered the DVD and plan to distribute over 10,000 of these DVD’s. This will surely create a ripple effect that will be felt world-wide by the LDS community. The LDS community is a tight knit, very well connected subculture. If only a few Mormons are saved as a result of this outreach, the impact will reach deep into the Mormon community. We are praying that outreach opportunities like this one will eventually become the straw that breaks the camel’s back. Not by power, nor by might, but my His Spirit!!! We do not care how many DVDs you order – we just want to touch Mormons all across the world. So if you know any Mormons… order the DVD and drop one on their doorstep. Then pray and see what God will do. Contact T.G.M at trigrace@gmail.com for more information or to place your order, but hurry, they will be placing this one-time large order very soon. Catholics who believe the literal interpretation of John 6 face a serious dilemma. Both the “eating and drinking” and “believing in Jesus” produce the same result—eternal life. What if a person “believes” but does not “eat or drink?” Or what if a person “eats and drinks” but does not “believe?” Does this person have eternal life because he met one of the requirements but not the other? . . . God forbids anyone from consuming the blood of a sacrifice. If Jesus were teaching the multitudes to literally drink His blood, He would be teaching them to disobey God.